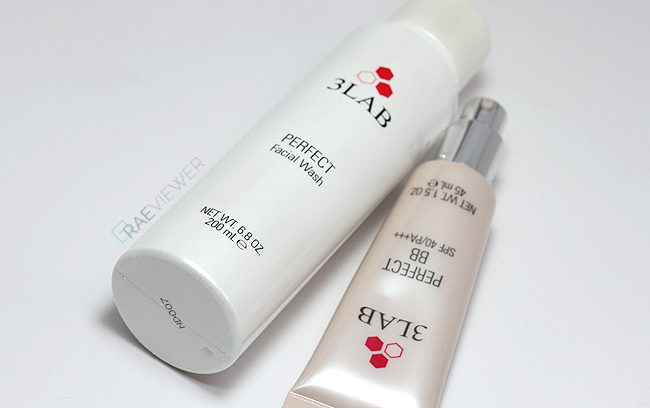 3LAB is superior skincare straight from the lab. 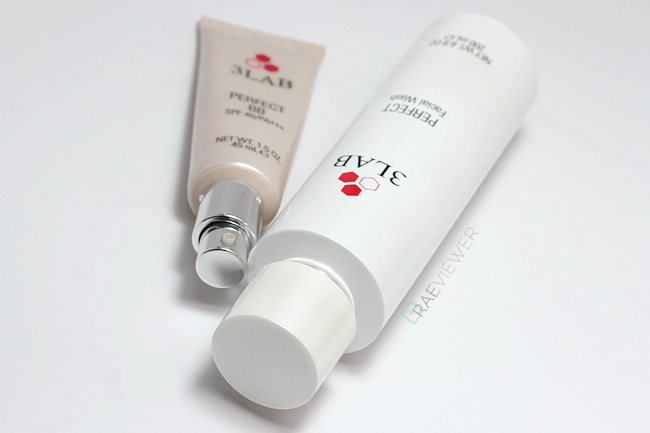 I was recently introduced to this brand by my sister, who is a big fan of the Perfect BB Cream. I insisted that no BB Cream could win me over more than the Kiehl's silicone-free BB, but she proved me wrong. The more I discover about this brand, the more I am convinced that beauty insiders who tout this as the perfect anti-aging skin care are correct! There are 3LAB products for every skin care need, like reversing the sign of aging, improving the health of skin or preventing future damage. Even celebrities like Jennifer Lopez are fans of the product, so check out the individual product reviews after the jump! I am very particular with my night creams, since many are too heavy for my normal skin and result in unsightly cystic acne. I used Lancôme's Genifique Night Repair cream for a couple years but have been on the hunt for a new night cream to switch up my routine. I will turn 25 in exactly six months and have finally started to see the signs of aging affect my forehead. I never had lines when I raised my brows, but I spotted a small crease developing a couple months ago! The smoothing effects of this Perfect Cream have reassured me that my slight wrinkling will not get deepen any time soon. It is intended for dry/normal skin like mine and was made to reduce wrinkle depth with the help of the Nano-Claire GY, the world's first bio-engineered growth hormone. A little goes a long way, and the antioxidants and nutrients plump and soften my skin overnight. I've never been a fan of BB Creams, but I used Dior's DiorSnow BB before Kiehl's introduced their Skin Perfecting BB earlier this year. DiorSnow was the best that I had encountered at the time, since it did not break out my sensitive skin and offered SPF 50 without much greasiness. The color was a fairly good match for my light-medium skin, but the formula tended to cake around my nose and brows after four or five hours. The Kiehl's BB Cream [review here] has topped my list thus far, even with its very dewy finish. That is where the anti-aging 3LAB Perfect BB Cream comes in to play, since it is the only BB Cream with a satin finish that I have ever encountered. This tinted moisturizer is designed to regenerate new skin cells, brighten, moisturize, and protect the skin. I adore the fact there is no gimmicky shimmer in this formula, and it can be used as a foundation primer as well! I use Shade 01 Light, which is the equivalent to a MAC N25, and I top with a sheer bronzer like Chanel's Les Beiges in 30 to balance and warm up my complexion. 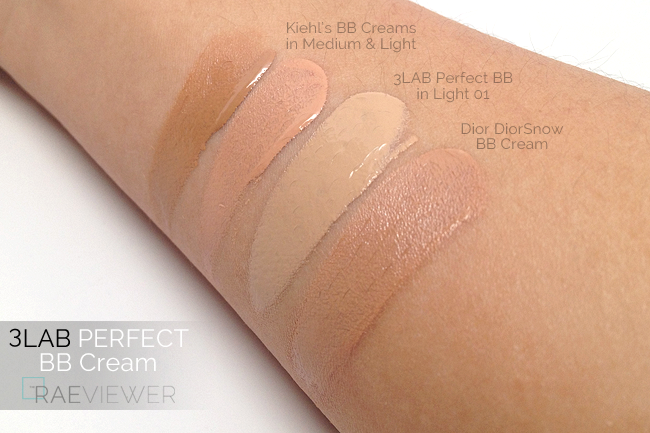 I may have to purchase 02 Medium to mix the two for the perfect match so that I can wear the BB Cream alone. It conceals my redness exceptionally well, but I still prefer to wear concealer on my discolorations for a flawless finish. I have read online that 3LAB will release powder products next year, so I am very excited to see if they will pair well with the Perfect BB! *Don't forget that sunscreen is the essential step to wrinkle prevention. Don't rely solely on night creams and serums to try undoing the damage when you can prevent it with a broad spectrum sunscreen! I still use my Kenzo Ice Cold Eye Cream in the mornings to prevent from running out of this fabulous eye treatment too quickly, but I am a believer! My sister had also raved about the C and the (miracle) WW Eye Creams, and I can finally see why. My eyes are plagued by dryness, which can make under eye concealer or highlighter look patchy. 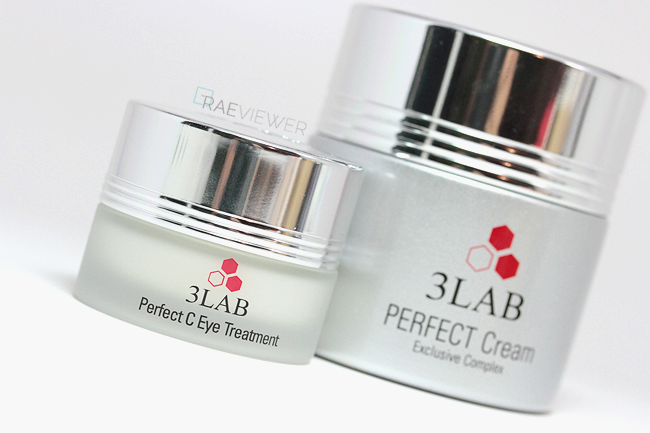 With this Perfect C Eye Treatment, I can relieve the dryness and prevent eye wrinkles with one product. It has just the right consistency to sink into the skin within minutes and is not overly rich to prevent from causing milia. 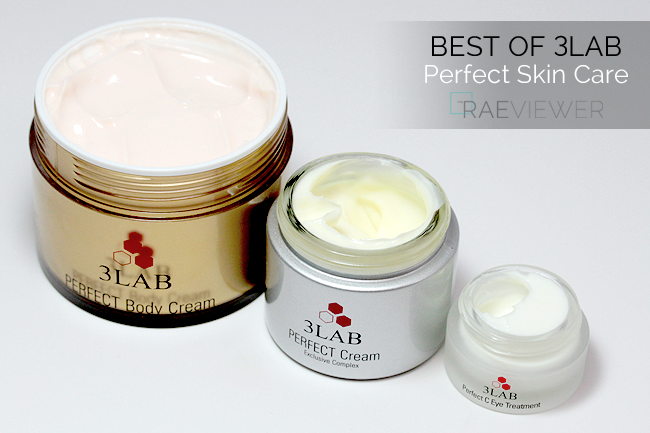 I normally use my Jo Malone Body Creams to pamper my skin, but the 3LAB Perfect Body Cream is ideal for dry and mature skin. Some may not see the merits in treating your body to the same anti-aging care that you give your face, but I believe that the sun exposure our bodies experience over the years can give away our age just as quickly as crow's feet around the eyes. This silky body cream promotes a healthy glow and helps to reduce the appearance of skin imperfections while tightening and hydrating the entire body. It may have a hefty price tag, but it rightfully won an Allure Magazine 2013 Best of Beauty Award Winner, as this is one of few body creams on the market that can that repair, firm, and tone. I also love the subtle coriander and sweet orange scent and its ability to melt into the skin instantly! Of all the skin care products in my regimen, I consistently finish cleansers first. I have a few mainstays in my cabinet, but I am loving this multi-functional 3LAB Facial Wash because it combines cleansing, exfoliating, and blackhead/whitehead reducing properties. It is ideal for oily skin skin, which is why I only use it once a day to prevent drying out the skin. After removing my makeup, I work a small amount of this liquid cleanser into a lather in my palms and massage my face. The 2% salicylic acid is effective at keeping my acne at bay while the green tea extract, an anti-inflammatory, calms the skin. 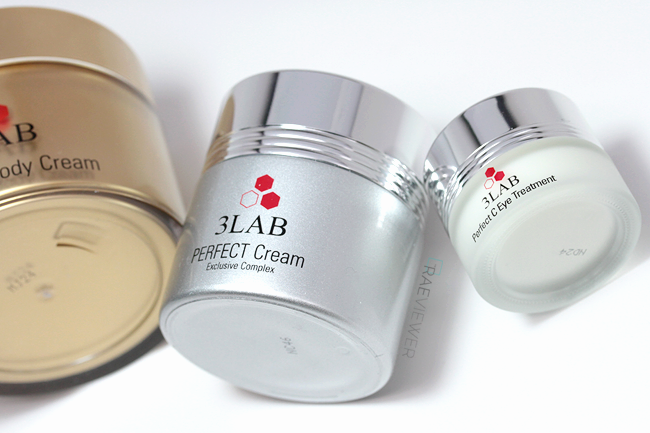 3LAB skin care is undeniably expensive. I, however, have always encouraged using the best skin care available to you because maintaining a healthy, glowing canvas on which to apply makeup is more important than the makeup itself. Beautiful skin will allow quality makeup to apply even more flawlessly! The full range of 3LAB products can be found at 3LAB, Nordstrom, and Barney's. Bottom Line: This PERFECT skincare regimen is truly working wonders on my skin, and this is one of those 'game changer' brands that I look forward to using for years to come! Wow... I am very impressed by the color on that bb cream. It's dead on MY SHADE! Love it! The facial cleanser sounds amazing as well since I have been dealing with hormonal acne time to time. Never tried this brand but always been curious about the quality and results. Only if the prices weren't so steep, I'd actually give it a try. Either way, it was an awesome post! 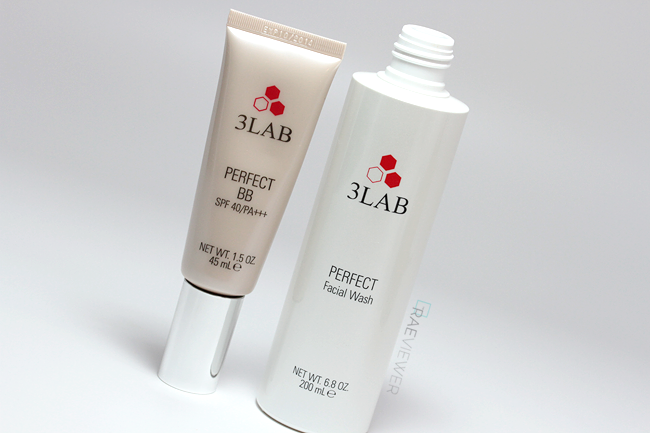 I love 3Lab and use M Cream and the BB Cream on weekends (or for summer water sports). A shopping tip is to sign up on Dermstore and save the items to "Favorites". You can regularly purchase your favorites for 10% off, sometimes 20% off (by occasional promotion)! It makes it much more affordable, and their service is very good. Love your blog!!! Is the 3lab bb cream silicone free as well? 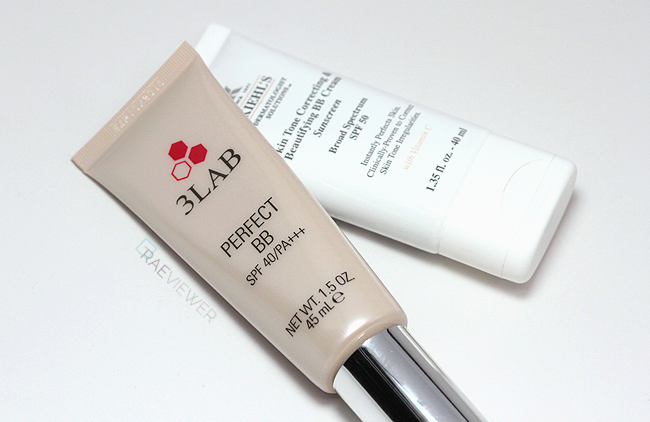 The 3Lab BB cream seems like the perfect shade for me as it has more of a yellow undertone versus the Kiehl's BB cream. 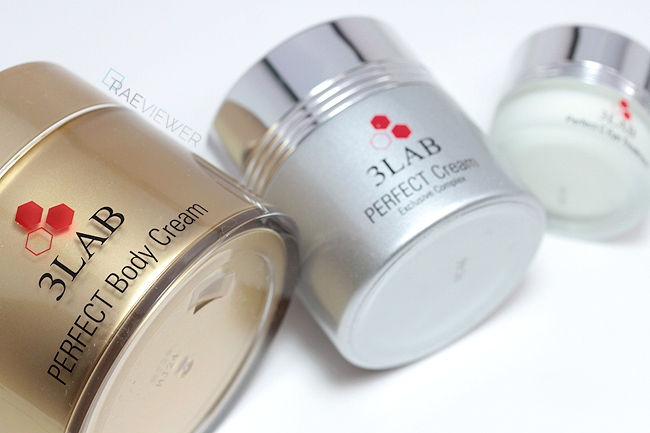 At the moment, is your go to BB cream the one from 3Lab? I wasn't quite sure from reading your review. Candice, my favorite BB cream right now is indeed the 3LAB. I love the Kiel's, but I wish they'd create a Light-Medium color! Been trying to figure out whether to invest into 3lab or La Prairie. I have combination skin, sensitive, and slightly prone to acne. I'm aiming to get a anti-aging product, but at the same time hydrating.... which of the two would you recommend? Thank you so much! !